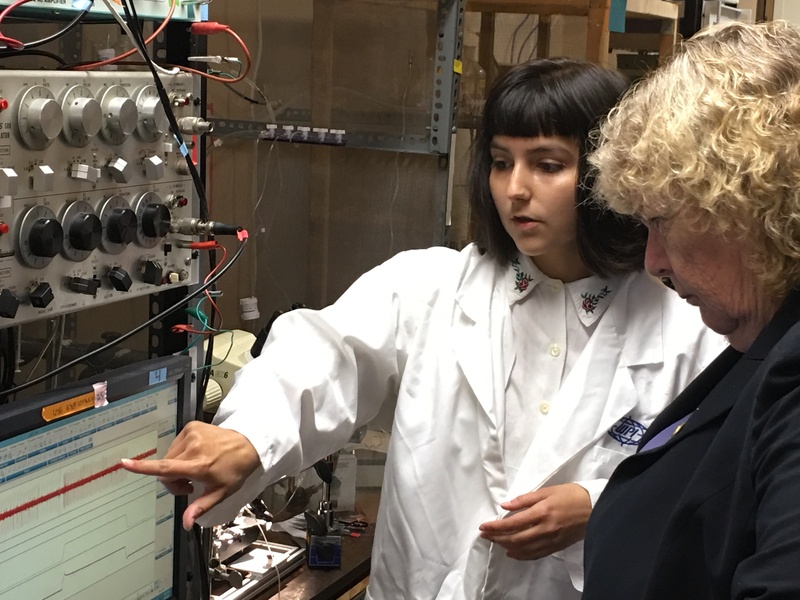 Natanya Villegas, a research student in Prof. Wilkinson’s laboratory at SJSU and a student in the MARC program funded by NIH, describes results from a neurophysiology experiment probing proprioception to Rep. Zoe Lofgren. On Wednesday Aug. 9, US Congresswoman Zoe Lofgren visited two research laboratories in the Biological Sciences Department to learn about the impact that federal research funding is having on our students’ education. Her visit, at the invitation of Prof. Katherine Wilkinson, brought her to Duncan Hall where she visited Prof. Wilkinson’s research laboratory studying the neurophysiology of proprioception and Prof. French’s research laboratory using a fruit fly model for studying the biochemistry and genetics of fetal alcohol syndrome. Rep. Lofgren also observed a teaching laboratory experiment developed by Profs. Ouverney, Wilkinson, and Grillo-Hill with technical help from Daniel Corral, Matt Voisinet and Marco Parent based on the new technique of optogenetics demonstrating that research activities can quickly reach the classroom to keep students abreast of cutting edge technology when the teaching faculty are also active researchers. Funding for the research on display was from several sources including the National Institutes of Health, especially the MARC and RISE programs. The faculty and students thanked Rep. Lofgren for her leadership as a member of the House Science, Space, and Technology Committee leading to continued funding for the NIH and NSF in the 2017 omnibus appropriations bill that passed Congress in May.